This post has been published by me as a part of the Blog-a-Ton 41; the forty-first edition of the online marathon of Bloggers; where we decide and we write. To be part of the next edition, visit and start following Blog-a-Ton. The theme for the month is "SWEET AND SOUR"
"Really very sad news thanks for the news" He disconnected the phone. He was little sad but very happy as there wasn't going to be any shortage of news now and he would be able to keep the channel busy for few days non-stop. He was also happy for Ad-Money they were going to earn. And then everyone ran from their homes to only one destination. It was a very confusing scene with everyone talking at once as they all wanted CM's comments on the issue. But CM was still busy handling and directing the officers and weren't yet ready to address the press. After all what can one say after such a tragedy? Kids were sitting in a line for their lunch. They ate their food and it was different than usual, it tasted little different, it tasted a little sweet and sour. 91 kids died after eating Midday meal. It was indeed a busy day for the news channels and very sad day for everyone else. Nice work !! Kept my curiousity alived till the last paragraph. You are THE STORY TELLER !! Thanks Binzy for the words of appreciation. Comment like yours is the fuel that keeps me going. All luck to you Vikas! A really well thought concept presented flawlessly. Though, I felt there were a few grammatical errors but those things shouldn't matter with such a beautiful story. Keep up the great work! Thanks so very much Deepansh for such a wonderful comment. Thanks for pointing out the errors I would try to minimize them going forward. great story Vikas!! and that was one tragedy that was heart wrenching....may it never happen to any child ever again. Glad you liked it Mudit bhai. I didn't check other entries till now so sorry for that. Hmm somehow I thought the story as soon as I came to know the topic. Thanks Ayushi for your comment. I would truly try for fiction for my next entries. Very nicely written and interest maintained till the end. Sufficiently long to build the drama and succinct enough to not get boring. Very literal take on sweet and sour and a well narrated tragedy. ATB for BAT!!! Read mine at Aashish - Sweet and Sour!!! Thank you very much Parvathy. Really sweet and sour, Vikas, but the confusions sorta confused me too. 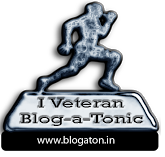 If you don't mind me saying, I've seen much better Blogaton's from your pen :) All the best. Why would I mind an honest feedback Leo? Like they say you get to see ups as well as downs maybe this wasn't as up as I wanted it to be, but I really appreciate your comments and would try to be better. Thanks so very much Cifar for your wonderful comment. Thank you very much Megha for the encouraging comments. Aapka bahut Dhanyavad SP sahab. Interesting story, Vikas...ATB for BAT! Thank you very much Panchali ji for the comment. I need all of you and your continuing support. Thank you very much Amit. Glad that you liked it.